Home ›› Retail Insights ›› What is the state of Austrian food retail? What is the state of Austrian food retail? 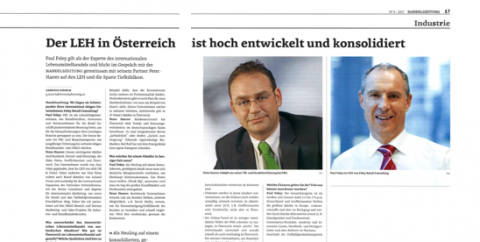 Paul Foley, founder and partner at FRC and Peter Harrer, senior consultant at FRC, were interviewed for the Austrian trade magazine „Handelszeitung“. They discussed grocery retailing in Austria with special focus on frozen food. Paul Foley highlighted that the Austrian grocery retail is highly developed, consolidated and professional. Three main players namely Rewe, Spar and Hofer cover 80% of the market and are all three extremely profitable. Due to the consolidation going on in recent years, the Austrian market is mature and the Zielpunkt-failure is a proof that Austrian customers wouldn’t tolerate anything but high professionalism. Still there is space for new players, like Denn’s organic supermarket for instance. Looking at the brand side, Austria has developed many trends, which have influenced the German speaking world’s consumption habits. Rewe’s “Ja!Natürlich” and Hofer’s “Zurück zum Ursprung” are leading organic brands in their own right and the Austrian brand Red Bull invented the energy drink category, as examples. Paul Foley and Peter Harrer define the grocery retail trends on the product side as: Health messages, convenience food and individualisation are becoming more and more important. On the concept side hypermarkets and supermarkets get under pressure and smaller proximity supermarkets are in coming, whereas the discount market will still be growing in countries, where discount is underrepresented (less than 25% market share). Another major trend – the online retail develops both, quickly but also sustainably in Austria, contrary to less developed parts of the world. Being asked to comment on frozen food, Paul said the category has an average European market share within Austria. It is associated with lower quality than its fresh counterpart, although fish and ice-cream are exceptions, and will require some significant marketing spend. For the full interview (in German), click here: “Der LEH in Österreich ist hoch entwickelt und konsolidiert”. For more information on grocery retailing in Austria, please get in touch with us here.